Garlic smells delicious when it's being sautéed in butter, but foul when it's in someone's mouth. Why? We'll tell you about the remarkable tour a garlic compound takes around your body, and why it ends up right back in your mouth. 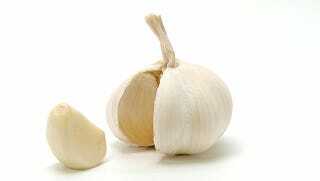 First of all the scent of garlic comprises many compounds, some of which do not smell so good when they're isolated. The big bad among these is allyl methyl sulfide. The stink comes from the sulfur in the sulfide. Not only is it the most offensive garlic scent on a person's breath, as judged by a group of very brave study volunteers, it lingers in the mouth. When subjects consumed garlic, many different odorous compounds occupied their mouths. A quick brush of the teeth got rid of most of the compounds, but not allyl methyl sulfide. Either it couldn't be scrubbed off or it reappeared in the mouth long after the garlic itself was gone. A test of lung air and urine narrowed those options down. While the other compounds didn't appear anywhere else, allyl methyl sulfide popped up everywhere. The fact that it appeared in urine meant the compound made it through the kidneys whole. It was, however, being absorbed by the stomach, and put into the bloodstream. From there, it made a long journey around the body, showing up everywhere. It crossed into the lungs and was breathed out along with carbon dioxide. It came out all over the skin in sweat. And it combined with saliva. In short, garlic breath lingers because it doesn't come from leftover traces of garlic in the mouth. It comes from the garlic being digested by the gut, and taking a trip through the bloodstream. Brush your teeth, and it will just keep coming back as long as you are digesting garlic.